For day two, we walked The Strip and stopped in casinos along the way. We have to admit, though still not a luxury casino, Bill’s Gamblin’ Hall seems to have cleaned up its act quite a bit. We stopped in at a few of the numerous half-price ticket locations along the way, but having seen many of the Cirque shows, Penn and Teller (which is amazing by the way), and some of the female impersonators on past visits, a shot at discounted Carrot Top seats didn’t move us to buy. 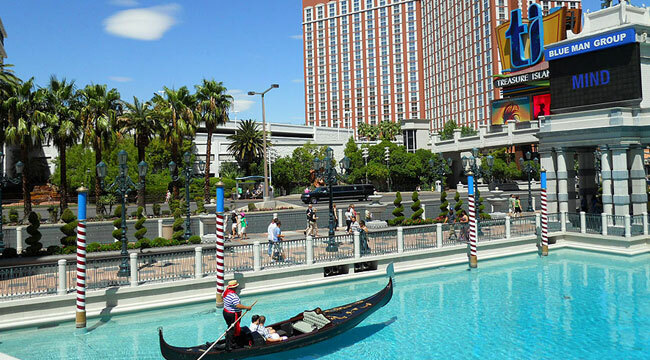 We also passed on an opportunity for a gondola ride at The Venetian because the next extended cruise wasn’t for an hour and we didn’t feel like being paddled around the limited pool outside in 103-degree heat for $16 per person. Eventually, we ended up at the Wynn and Encore, Steve Wynn’s still relatively new super fancy hotels/casinos. 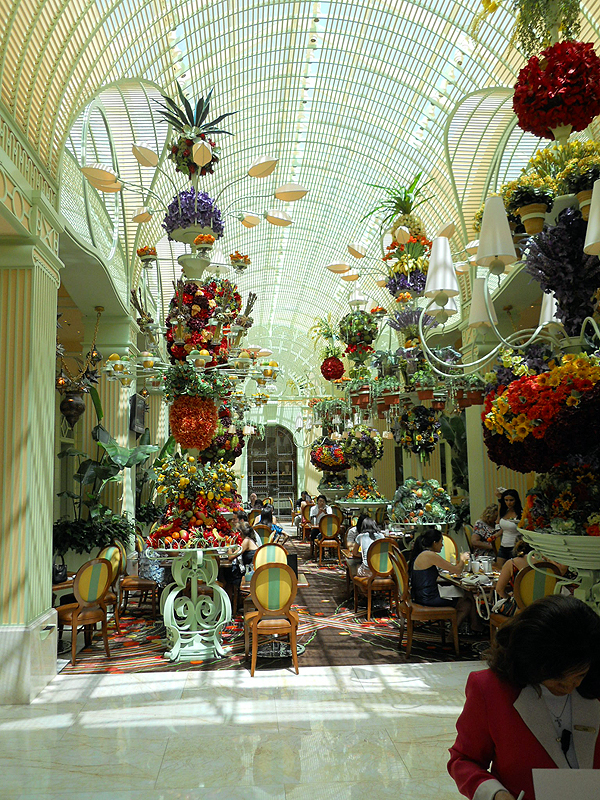 We especially liked the buffet (simply called The Buffet) at the Wynn. While we’re not strictly vegan, we do try to eat healthy when we can, and the Wynn buffet has plenty of vegan options, including pasta and a number of Indian dishes with lentils. They’re clearly marked for people with food allergies. Even the luxurious dessert section, which included a range of gelatos and assorted pastries, had at least a couple of vegan items, including a couple of dairy-free sorbets and some vegan chocolate chip cookies. We then did a little shopping at Fashion Show Mall, which is located right across the street. It’s a full-scale mall, and we found some good discounts on clothes. While there, we caught a bit of a fashion show put on by Guess. A runway was literally set up in the middle of the mall and models strutted out wearing the latest fashions. The best part – it was free and open to the public. On our way back to New York New York, we swung by the box office at the Mirage to pick up our tickets for the Terry Fator show, which was part of our MGM package (we’d already seen or were not interested in the other limited options—KA, Viva Elvis, Lion King, Jabbawockees, Zumanity, Criss Angel Believe and Tournament of Kings at Excalibur–that were part of the package). Whether you purchased tickets through a discount ticket broker like Tix 4 Tonight or you obtain free tickets through a promotion, we recommend going early to exchange vouchers and pick up hard tickets. You beat the pre-show crowd and have time to negotiate for the best seats (though our seat assignments for Fator were already given). We also stopped by the Bellagio to get tickets for O, one of the few Cirque du Soleil shows we haven’t seen. While these tickets were pricey, the box office was offering a 25 percent discount on the more expensive seating, so it’s always good to ask if any discounts are available. 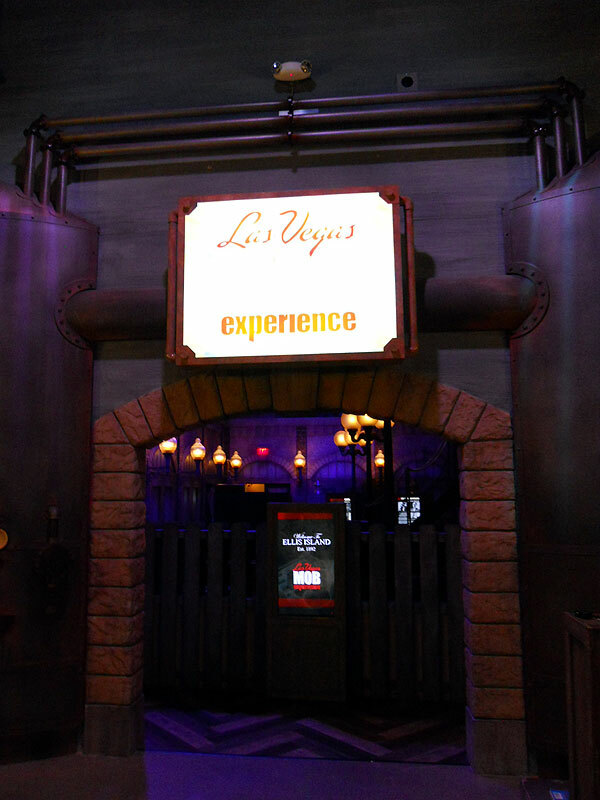 Then we went back to the Tropicana to walk through the Las Vegas Mob Experience, the hotel’s new interactive self-guided exhibit that revisits the mob’s connection to Vegas. (We’re eagerly awaiting the opening of the Las Vegas Museum of Organized Crime and Law Enforcement . . . aka the Mob Museum, slated to open in old Vegas in February of 2012.) We were hoping to find a half price ticket voucher in the hotel lobby but were unsuccessful and plunked down the $30 to go in. After learning a bit about U.S. immigration politics in the early 1900s, you get your mug shot taken and then proceed to re-enact a payoff with a couple of actors playing mobsters. Although the actors were very solid in their roles, we had a few video glitches that got us off to a shaky start, but then the “experience” became more information-driven. The history of Bugsy Siegel and how and why he came to Vegas is explained in series of wall panels with photos and descriptions. You see what the gangster’s living rooms looked like and learn about the “hole in the wall gang” and how they brought the mob’s control of Vegas to an end. It was a mixed bag, but we were certainly glad we did it. After, we window shopped at Planet Hollywood’s Miracle Mile and gave ourselves a nightcap by buying a few cheap beers at one of the many ABC Stores that line the strip (they have the cheapest prices on booze), playing a few more slots at New York New York before calling it a night. 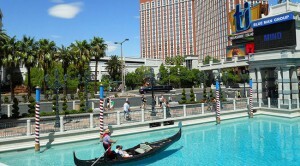 Tomorrow we head downtown for classic Vegas and stop by the Strat to see the changes there.